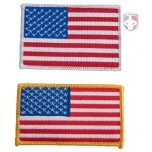 Find USA flag patches for lacrosse referees with gold or white border in standard (typically worn on left sleeve) or reverse (typically right) direction styles. 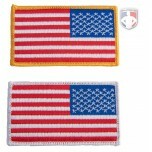 Great patch!! Used it for every High School game, looks very professional. Ump-Attire.com is Outstanding on all products wouldn't use anyone else! Reverse flag option is great. Gold trim makes it sharp looking. Thanks for having the reverse option patch. It is hard to find that anywhere else and offering option gold framed(for military service)or regular white is important to me and many others. AWESOMENESS!